Homepage. 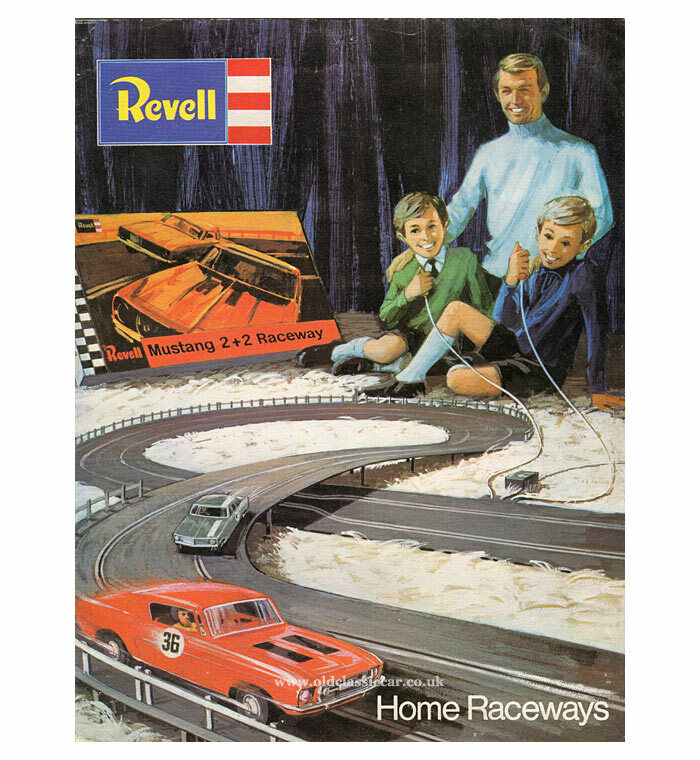 This page: Multi-player slot-car racing sets produced by Revell in the USA. The prices given in this UK-market edition of an old Revell Home Raceways leaflet are in pre-decimal form, dating this leaflet to around 1970 or so, given that decimalisation took place in 1971. Until I found this leaflet, I'd associated the name Revell more with plastic construction kits, having put together a few of their aviation-related kits in the late 1970s. In the UK at least, Scalextric was (and is) the big name in slot-car racing, but in America, Revell was well-known for producing a variety of "Home Raceways", offering a choice of 1/32 and 1/24 slot-cars and differing track configurations on which to race them. 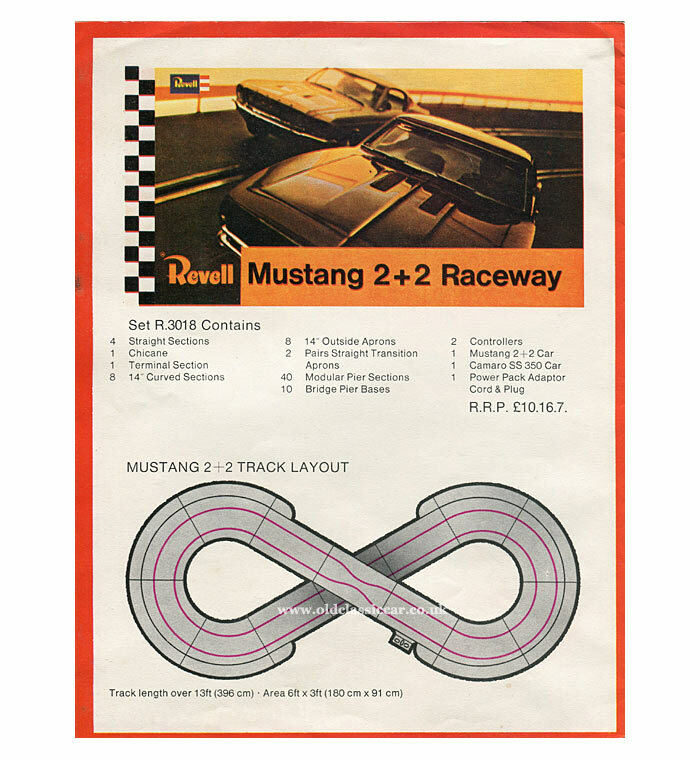 The Revell Mustang 2+2 Raceway (R3018). The first set to receive a mention is the Mustang 2+2 Raceway, reference R3018. 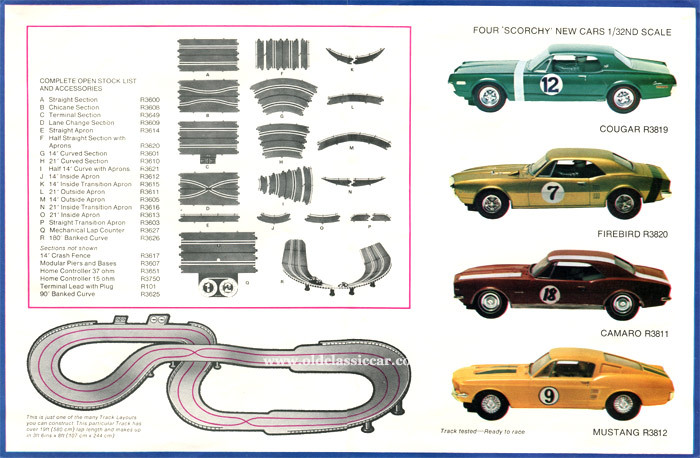 A figure-of-eight race track came with this set as standard, as did a pair of race cars - namely the Ford Mustang, and a Chevrolet Camaro SS350. The track ran to over 13ft in length. While fairly basic, with just a single "pinch point" to liven up the action, it would have been a good introductory set for anyone new to slot-car racing in the early 1970s. "Scorchy" Revell cars and accessories. The leaflet also describes four new cars that had recently been introduced, in 1/32nd scale as before. These were as follows: Mercury Cougar (R3819), Pontiac Firebird (R3820), the Chevy Camaro (R3811) and the Ford Mustang (R3812). The illustrations also show the many different optional upgrades on offer, all designed to make a Revell raceway all that more enticing to play with. The "lane change" section (R3609), the 180 degree banked curve (R3626) and the mechanical lap counter (R3627) would all have been on my next Christmas list, as would a few new cars. 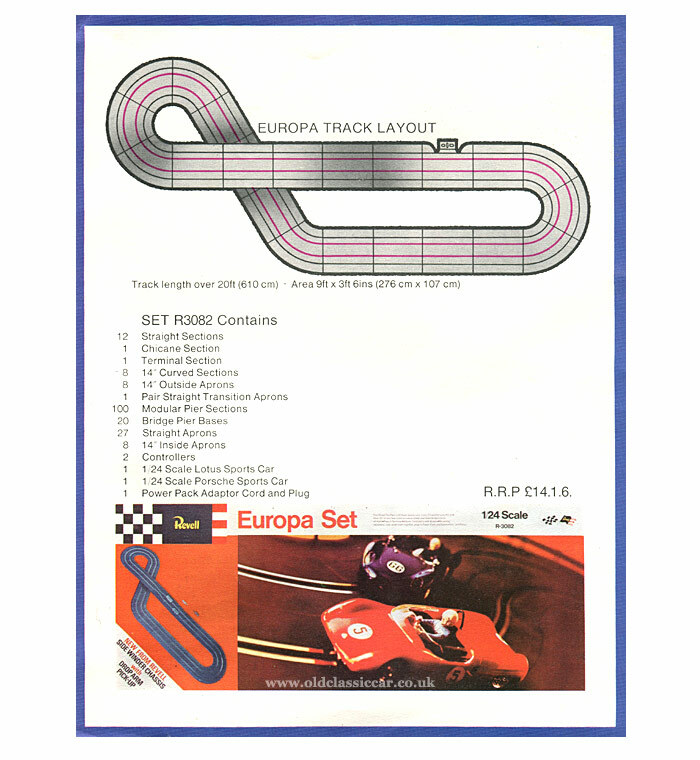 The Europa set cost nearly half as much again as the Mustang 2+2 Raceway, but for the extra cost you'd now have a track over 20ft in length. The cars were also to a larger scale (1/24th), the drivers having a choice now of either a Lotus or a Porsche sports/racer - hence the Europa name for this particular package. Back to the smaller, 1/32nd, scale for the remaining three sets to feature in this leaflet. The first pits two identical Ferrari 250 GTOs against each other, on an oval course. The set was titled the "Nova Home Racing Set" (reference R3006). 10ft of track was included, and the player(s) had to supply their own power pack, which was reflected in the pared-back price tag. Set R3000 ("Gran Turismo Racing Set") promised exciting duels between one of Europe's finest - the 250 GTO again - and America's home-grown Corvette Stingray. Revell - "Finest in Quality - in durability - in performance!". Finally, the "Premier Racing Set" (R3010) which was actually the cheapest of the lot. Again it came with a GTO and Stingray, but with just 7ft or so of track (compared to 13ft+ in the Gran Turismo offering, above). Buying any slot-car set was (is) often just the beginning. Before long, the desire to accessorise and personalise a set, perhaps to ape a particular real-world track, begins to emerge and requests for extra cars, pit buildings, crew members, signage and more will often follow the joyful receipt of a set, such as one of those shown above. A quick search online demonstrates just how many people are still big fans of slot-car racing, and reveals the many suppliers out there who can offer all manner of upgrades to the home-racer, the only restrictions being space in the home to have a layout, and the depth of one's pockets to improve it. Return to the car-related games section, where you'll examples of other, car-related, games and puzzles.